Zion is one of America’s favorite National Parks! More than 4.5 million people visited Zion National Park in 2017 and the trend shows constantly increasing attendance. 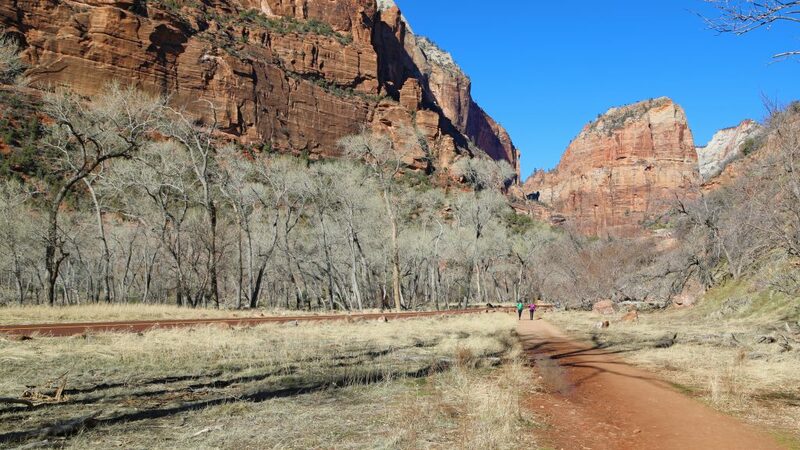 A big part of this increase is because of the Zion National Park Trails! The name Zion alone instantly brings thoughts of several iconic hikes within the National Park System. I have personally hiked almost every trail in the Zion Canyon area and love each one, each for its own reason. There is everything from easy hikes to strenuous hikes, even trails to go for a bike ride, horseback ride and even take your pet for a walk. I can’t think of a better way to spend a day then going out and exploring the best hikes in Zion! 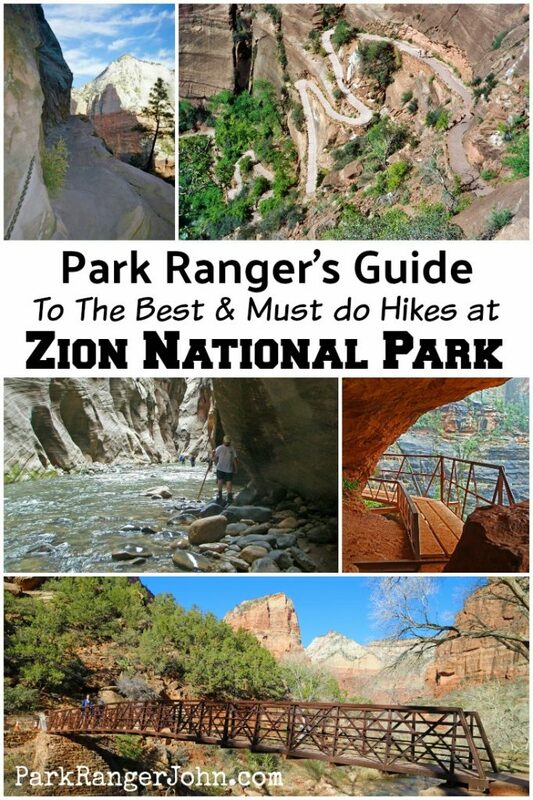 Here is my list of 13 Zion National Park Hikes not to miss on your trip to Zion. Caution: Check visitor center for Flash Flood Conditions before starting this hike. 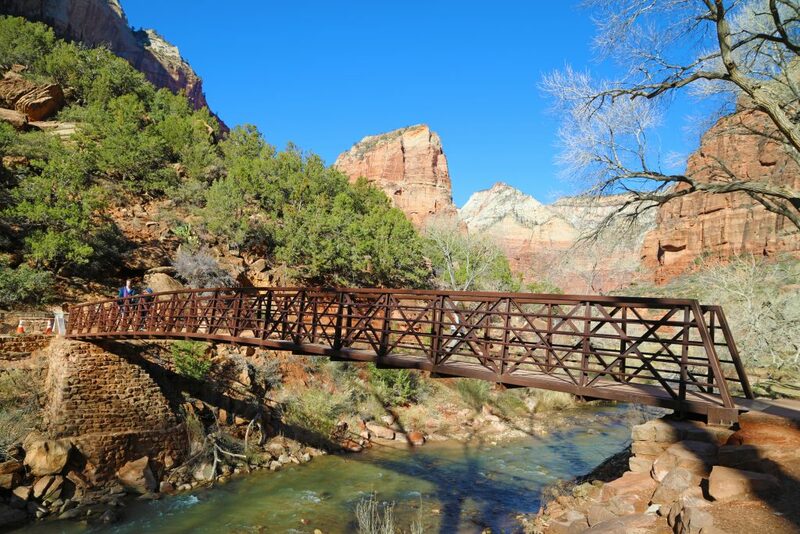 The Zion Narrows Hike is a must do for anyone visiting this park! This classic hike can be done in one of two ways. Most people take the park’s shuttle bus to the Temple of Sinawava shuttle bus stop. From here they hike the one mile Riverside Walk and then enter the Virgin River. From here most people usually hike upstream for two to three miles to the famous Wall Street and Orderville Canyon area before turning around and heading back. Wall Street is where the canyon is very narrow and the walls of the canyon are very tall. The sun never really sees this section and you are pretty much just walking in the river at this point. The second option is to get a shuttle to Chamberlain Ranch and hike down 16 miles of the North Fork of the Virgin River. This requires a permit and take two days. Hiking the Narrows does require some preparation. You will need sturdy shoes and trekking poles. There are outfitters just outside the park who rent water shoes and hiking sticks. You will also need to check with the park visitor center and check the flash flood danger before heading out. This hike is typically done during the summer and fall. The Riverside Walk is an easy hike on a one-mile paved path (two miles round trip). It has stunning scenery with the Virgin River flowing to the side of you making it feel very peaceful. I have seen deer every time that I hiked this trail and have even seen a tarantula! The end of the paved trail also marks the beginning of my favorite all-time hikes the Zion Narrows! Zion National Park Angels Landing Hike is one of the most memorable hikes you can experience in Zion, both mentally and physically. It all starts off as a leisurely hike as you cross a bridge and make your way up towards Refrigerator Canyon and Walter’s Wiggles. This is where you feel like you are on a stair climber for what seems like forever. Walter’s Wiggles is a series of switchbacks that steeply climbs up to Scout’s Lookout. This makes for a great resting spot before heading up to Angels Landing. It gets much more exciting from here out as you find yourself holding onto chains and hiking along sheer drop-offs! Did I mention this hike is not for anyone with a fear of heights? I mean seriously you will be walking in areas that are only several feet wide and cliff drop-offs hundreds of feet down with only a chain to hold on to. I’m sure you will find my fingerprints in a few of the chains from me grabbing them so hard. The view at the end is truly something magical and makes the trek up worth it as you find yourself looking out into the heart of Zion! The Emerald Pools is divided into three parts; Lower, Middle and Upper Emerald Pools. I see books breaking this down into separate hikes but in reality, you can do this easily in one hike. Take the park shuttle bus to the Zion Lodge stop and cross the river towards the Lower Emerald Pools. Once you reach the lower Emerald Pools continue towards the Middle Emerald Pools then to the Upper Emerald Pools. From here you hike back down to the Middle Emerald Pools and then have a choice of either going back to the Zion Lodge the way you came in or you can make it a loop by taking the Kayenta Trail out to the Grotto. If you want to make a full loop then take the Grotto Trail back to the Zion Lodge! This was truly one of my favorite hikes! Trailhead: Left Fork Trailhead on the Kolob Terrace Road. The Subway is one of the Iconic National Park Hikes! Its popularity has risen rapidly over the years as photos like the one pictured above started showing up on calendars, postcards, and all over every social media channel. It has become so popular that the National Park Service had to begin limiting the number of people to protect resources and the crazy parking problems. you have to obtain a permit before entering. This trail also brings the adventure factor as you can do canyoneering going from the top down, doing some route finding, crossing water and scrambling over rocks and boulders. Due to the popularity of the Subway, the National Park Service has created an online lottery for reservations. You can fill out an online Advance Lottery application which must be submitted three months prior to your planned trip and is limited to one request per individual per month. You can request three prioritized dates and there is a non-refundable lottery application fee of $5.00. Click Here for more information on the National Parks Services website about hiking the Subway. 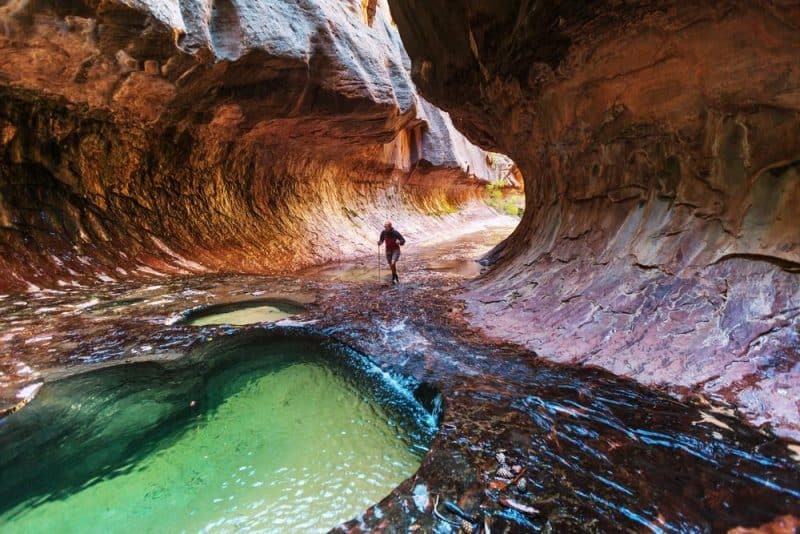 Park Ranger John Pro Tip: Don’t want to mess with getting a permit to explore the Subway Zion? Go between November-March as a permit is not required during these times as there is a low demand for permits. This is a great full-day hike in Zion with breathtaking views without the large crowds that you will find at the Narrows and Angels Landing! This trail starts off gaining elevation quickly up towards Echo Canyon. You will get a glimpse into Echo Canyon from the trail as you continue your hike. Remember that you have no business exploring this canyon or any other canyon unless you have a permit and technical canyoneering experience. As you leave Echo Canyon the East Mesa Trail cutoff is to the right where you could go to Cable Mountain and Deertrap Mountain but stay to the left and continue up towards Observation Point. The trail continues to be steep before finally becoming flat for the last mile. You will be ready for a break by the time you reach Observation Point! The view here is my favorite in all of Zion! 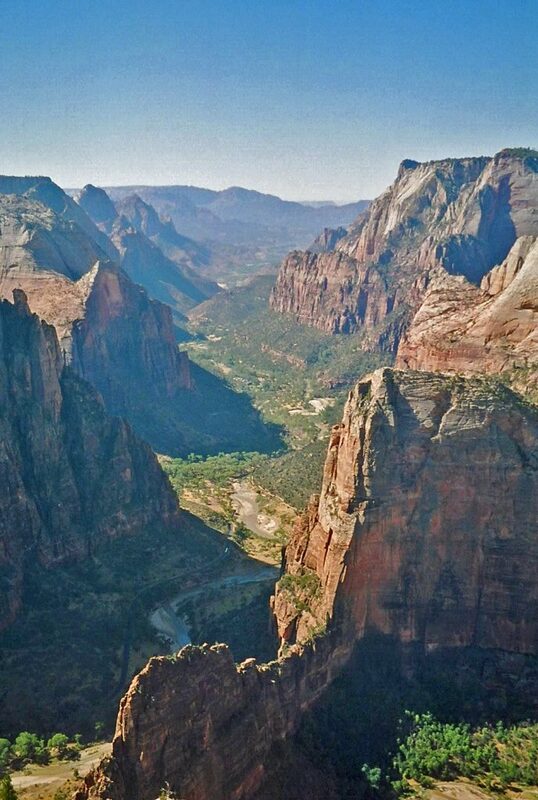 You look out and see the tiny sliver of road and Angels Landing well below you and all the way down the canyon. I sat back took my boots and socks off and had lunch with an amazing view! I personally always carry a spare set of socks with me as dry feet are happy feet and I was very happy to put them on before heading back down the canyon. 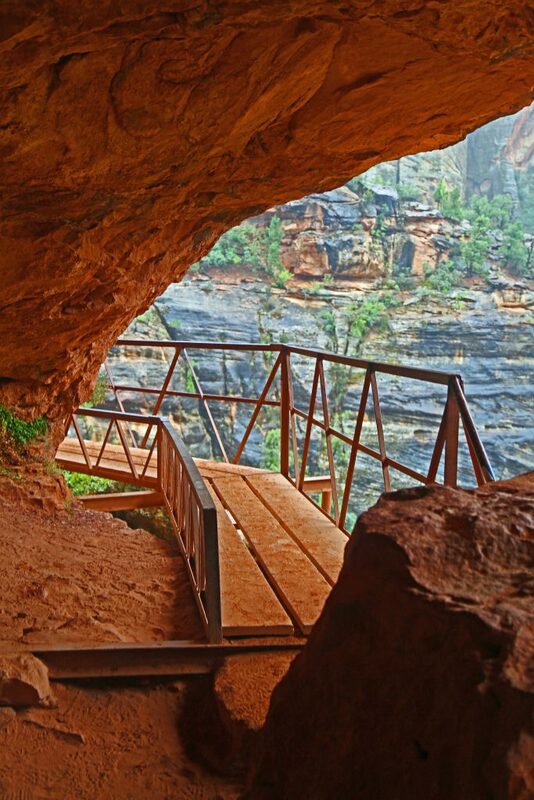 Hidden Canyon can be either its own hike or in combination with Observation Point Zion hike. I chose to do both hikes at once and it turned out to be a great idea, especially as most of the elevation change was from the parking lot to the trail cutoff between Hidden Canyon and Observation Point. 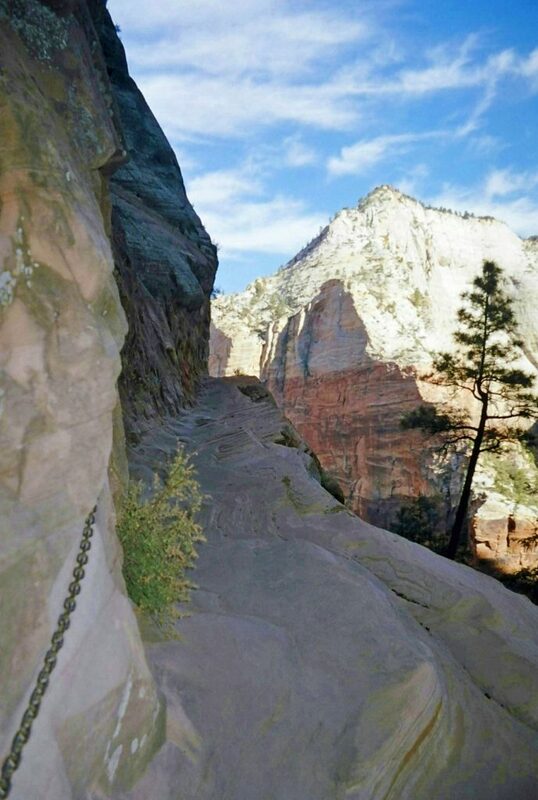 Hidden Canyon is absolutely beautiful and the hike getting to the canyon will give you a little taste of what it’s like to hike Angels Landing with its long drop-offs and chains to hold on to. The bonus here is that you have a wall with chains on one side instead of having sheer cliffs on both sides making it feel not as extreme but it will still provide you with some heart-pounding excitement. The trail technically ends at the mouth of Hidden Canyon but there is a beautiful Hidden Canyon Arch a short distance away and where I saw most people turning around. From here make your way back to the main trail and continue up towards Observation Point. Canyon Overlook Trail is located just outside the East entrance of the Zion-Mt. Carmel Tunnel. Parking is limited on both sides of the road and it can be extremely difficult to find a spot. It can also be a real pain to get in and out of the parking lot because quite often there is a long line to go through the tunnel. Having said that, this hike is fun! You start off with a series of steps and then a small bridge attached to the side of the cliff wall. It continues under the wall and out to a nice view at the end. It’s one of my favorite short hikes! The Pa`rus Trail is a nice easy stroll along the Virgin River that goes between the visitor center and Canyon Junction stop on the park’s shuttle bus. I found this to be a relaxing stroll with very few people as everyone tends to be on the most popular trails in the canyon. It also goes right by the South Campground and makes for a nice after dinner walk. 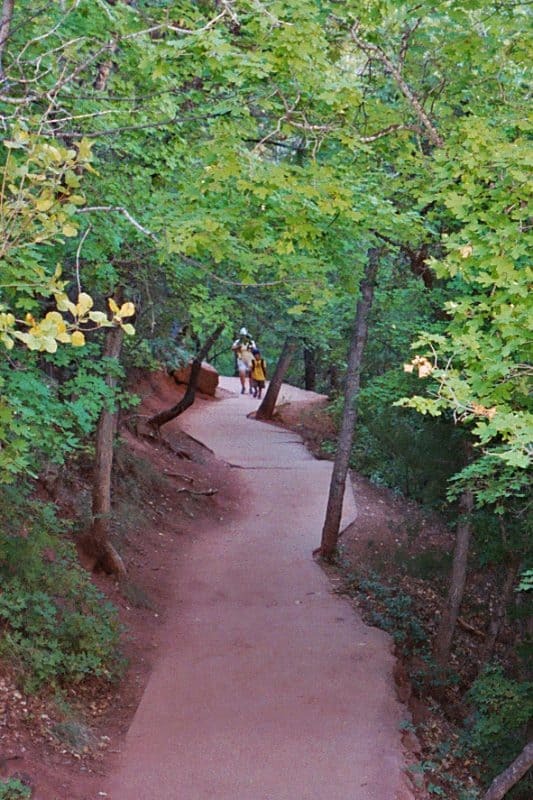 The Grotto serves as a connector trail between the Zion Canyon Lodge and The Grotto bus stop (where people get off for Angels Landing). I often find myself alone on this trail as most people just take the bus to wherever they are going. This works for me as I enjoy seeing the deer and turkey along this path. The Sand Bench Trail is well named! You will find yourself hiking in sand, sometimes soft deep sand. You will also have to take your boots off afterward to return half the sand from the trail back. This makes for a long day of hiking, especially when it’s hot outside. Also, note this is the path that the horses take. What made this hike great was the fact that I had the place to myself and did not see anyone else all day! Did I mention that you get a great close-up view of the Court of the Patriarchs? I rewarded my hard work with a shower, a couple of cold beers and a pizza after this hike. Park Ranger John Pro Tip: Instead of hiking the Sand Bench Trail, you can take a three-hour guided horseback ride. this is a great way to see the Canyon and saving yourself from a difficult, hot sandy hike. There are a few options to access Cable Mountain Trail. You can also access the Deertrap Mountain trail from the Cable Mountain Trail. I hiked both trails at once and made it a two for one! 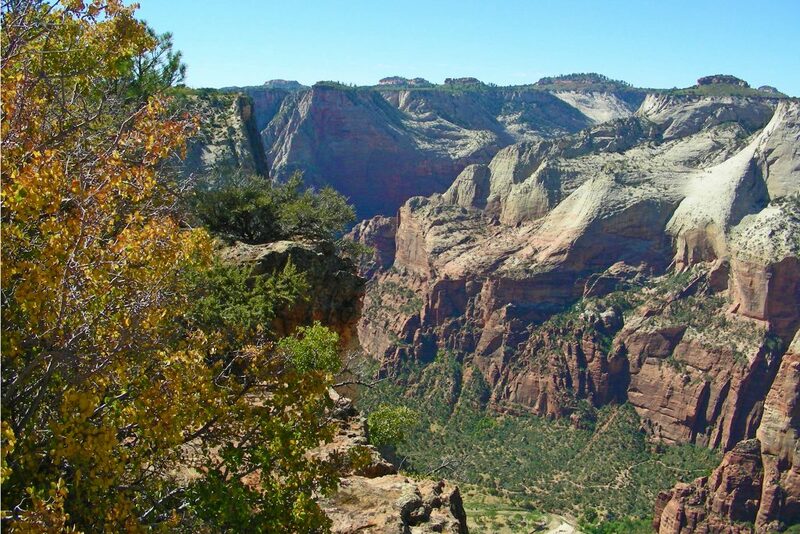 The first option is to hike from the East Entrance of Zion National Park on the East Rim Trail. The second option is to take the park shuttle bus to the Weeping Rock shuttle stop in Zion Canyon. 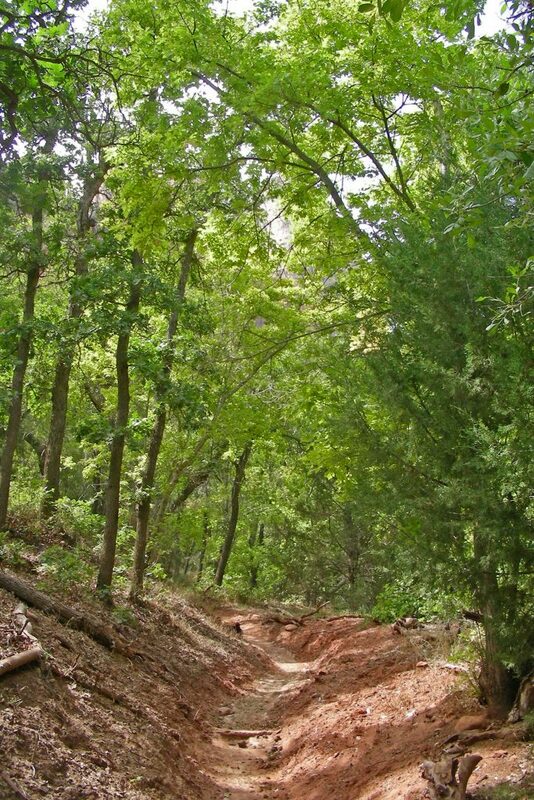 From here you will hike up Echo Canyon to the East Rim Trail then continue on to Cable Mountain or Deertrap Mountain. 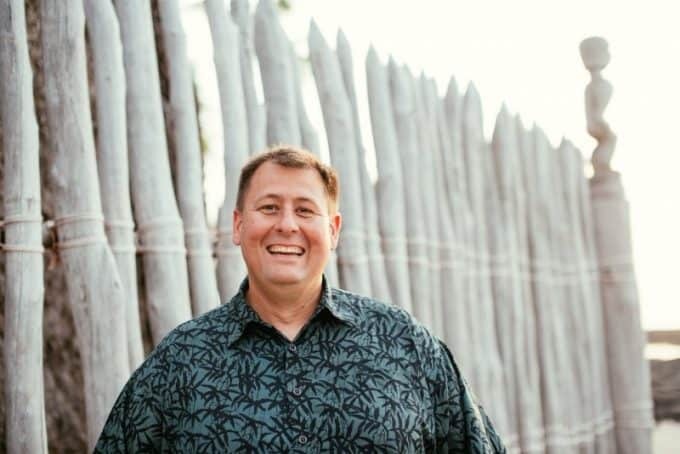 The third option, the least popular and the one I chose was to have a high clearance 4X4 vehicle and drive out to a trailhead at the border of the park behind Zion Ponderosa Resort. The benefit here is that you take half the distance off the hike making it a manageable one day hike instead of two. My words of advice is to always come prepared! Read my 10 Essentials post for a great example from this hike! The highlight to the Cable Mountain trail is a fantastic view down into the canyon plus you get to see the remains of an old wood frame “draw works” that was used to lower timber to the canyon floor. Now it’s up to you to decide to go to Zion and where you want to hike. Maybe you want to revisit a trail that brings up old memories or perhaps try something new. Whatever you may choose, I’m sure there is a great trail filled with great memories waiting for you. Enjoyed your article on Zion. My wife and I visited the park around May 20, and we’re, if course struck by its beauty. However, I got the impression, reinforced by your article, that Zion is best suited for hikers rather than more casual visitors like us. Although we are in our early 70s, we are healthy and vigorous, but I am afraid of heights. This ruled out just about everything going but the River Walk.my question: Do you think it is prudent for NPS to advise/warn folks that many of the hikes there are scary for many and require lots of energy? Thanks for a great article. Loved Arches and Bryce! Thank you for stopping an and reading my article. 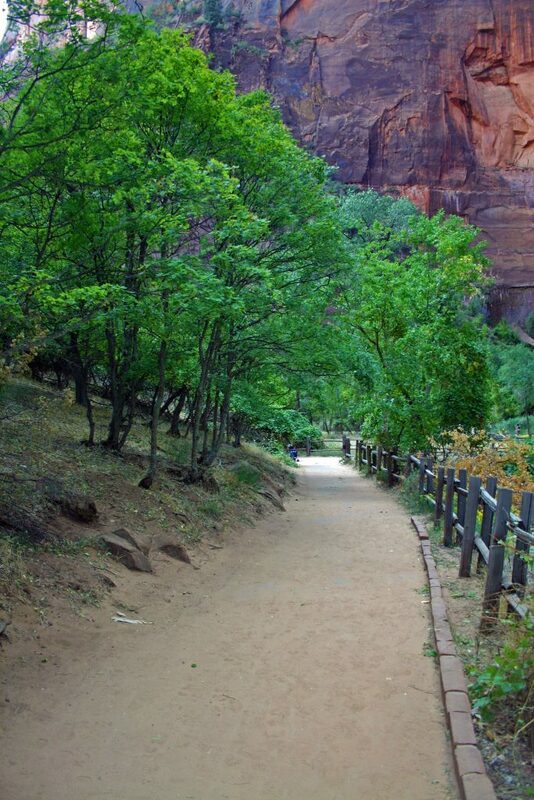 There are many things to do at Zion National Park for all physical abilities. It’s true that many of the hikes have steep cliffs and elevation gain as you go inside the Zion Canyon. There are several that you can still do. 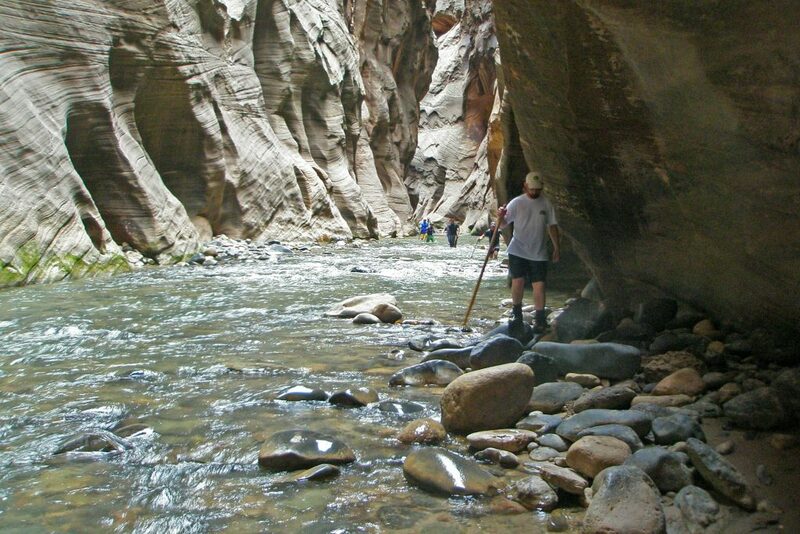 The Riverside walk is a beautiful paved 1-mile hike into the Zion Canyon before getting into the River to hike the Narrows. The scenery is beautiful too! You can hike the Grotto Trail, a 1/2 mile easy hike and I have seen deer every time I have hiked it. The hike to Lower Emerald pools is pretty easy and worth the trip as well, use your best judgment from there how far you want to go up. Also check out my article on things to do Zion for other activities in the park and good luck with planning your trip! We are staying on the east side. Any trail recommendations with kids? Cable Mountain-Cable Mountain is accessed through the East Rime Trail and has a nice view of Zion Canyon but again a long strenuous hike probably not for children. Deertrap Mountain- Also accessed through the East Rim Trail and a strenuous hike. Remember the East side is also a more remote part of Zion so if you decide to go make sure to carry the 10 essentials. There is also a good story of my experience needing the 10 essentials while hiking Deertrap Mountain Trail. I highly suggest visiting Zion Canyon. 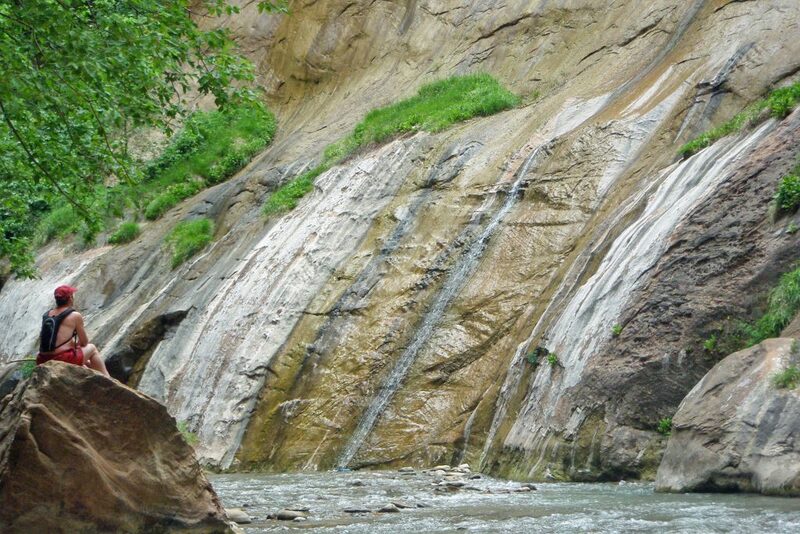 There are eseveral hikes suitable for children including the Riverside Walk, Pa’Rus Trail, Archeology Trail, Lower Emerald Pools Trail, the Grotto Trail and Weeping Rock. I hope this helps & enjoy Zion! Hi Jeff, That sounds amazing. I would love to see how the painting turns out.